It didn't take long for Aaron Judge to gain the attention of baseball fans and opposing pitchers as he knocked home run after home run during the start of the 2017 season. In spite of a brief slump, the onslaught continued and the Yankees slugger continued his assault on outfield fences until he hit the Most Home Runs by a Rookie in baseball history. 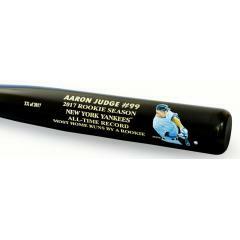 To honor his impressive debut we are proud to present this unique and exclusive collectible bat that every Yankees fan would love to display in their home or office. Judge surpassed the record previously set by Mark McGuire during his rookie season with the Oakland A's.